Last weekend I had the opportunity to join our friends at the American Livestock Breeds Conservancy for their annual conference in Kalamazoo, Michigan. The American Livestock Breeds Conservancy (ALBC) works to promote and preserve heritage breeds of livestock and is a partner with Chefs Collaborative and Slow Food USA in the Renewing America’s Food Traditions project. Livestock producers from around the country gathered at Tillers International to attend workshops on both raising and marketing these traditional breeds. ALBC’s work is more important than ever before as modern food production favors specialized breeds that are selected for maximum output in confined living operations. 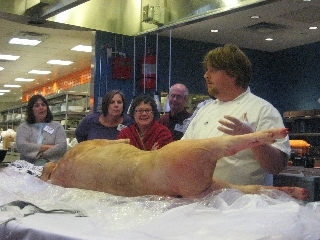 Chefs Collaborative was excited to partner with ALBC on two workshops throughout the conference, including a pig breakdown led by chef Matthew Millar of Journeyman restaurant in Fennville, Michigan. We met at Zazio’s restaurant in the Radisson Hotel in downtown Kalamazoo. Matthew broke down at 150 pound Tamworth pig that had been donated by ALBC producer Nila Robinson of Shiocton, Wisconsin. Chefs aren’t the only ones interested in learning how to work with whole animals. Producers are also interested in what happens to their animals once they leave the slaughterhouse and arrive at a chefs’ door. Marjorie Bender, the Research & Technical Programs Director for ALBC, facilitated an engaging dialogue between the audience and chef Matt. Questions regarding food safety, direct marketing, and culinary preparations were plenty. The highlight of the day was the preparation of the two tenderloins (yes there are only two per animal) by Judd, a line young cook, at Zazio’s. The tenderloins were lightly seasoned with a rosemary sea salt and seared to perfection. Many of the workshop attendees had never eated pork so lightly prepared and realized immediately what a special product they have. Many of these breeds have such beautiful and distinct flavors that preparation and seasoning is minimal. The remaining cuts were brought to chef Julie Stanley’s Food Dance Cafe, where the conferences’ inaugural dinner was taking place. 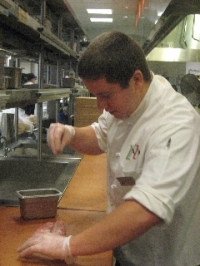 The menu featured Nila’s Tamworth along with Giant Chinchilla Rabbit, Red Poll Beef, and Bourbon Red Turkey. It was a real treat getting to see and taste, all of these beautiful animals and meet the producers who work so hard to bring heritage varieties back to our family farms and tables. To learn about the American Livestock Breeds Conservancy and their producers, visit www.albc-usa.org.